Well, 7,000 plus words and 32 great Sports Illustrated covers are up on my SI Blog. Hope you enjoy. I’m very tired. Love the Dave Logan cover at #32. You probably know that Logan is now the radio voice of the Broncos. He’s also a high school football coach who’s won a bunch of Colorado state championships. Fantastic piece. Maybe your best yet, and that’s saying a ton. Never heard of a smoking patio either, and I’m older than Joe. But it certainly sounds like a North Carolina thing. I’m surprised there wasn’t just one non-smoking table there. I graduated from high school in central Ohio in 1973; there was no smoking patio, but there was a smoking hill, about 30 yards from the school. Like Joe, I remember in those days it was a surprise when someone DIDN’T smoke. Yeah, we had a smoking patio out in SoCal. But then I’m as old as Joe (almost). Great article, nice pull on the Lambert cover I kept on my shelf through college. And I think the distinction between The Sporting News and Sports Illustrated was very finely drawn. Wow, Joe, I’m a year or two older than you, and it’s spooky how similar our experiences growing up were: Sports Illustrated, The Sporting News, 60 Minutes dread, Statis Pro Baseball (which I’ve seen you reference elsewhere), etc. And my high school did indeed have a smoking zone in the parking lot. I even worked as a sportswriter for several years in the late ’80s-early ’90s, so I’m really enjoying living vicariously through your success. You’re a must-read for any sports fan. Great job. In 1988, my high school had a smoking area. You needed a parental consent form filed to hang out there, which meant I was the only non-smoker around. We had two smoking areas in the mid to late 1970s. Actually, one was for smoking, which was legit. The other was for toking. It was between the “temporary” modulars and was definitely more popular. I remember in the summer of 1998, there was a cover that was ruminating on the potential dominance of Ohio State Football, and the cover blurb was something about how OSU would be amaizing if “Andy Katzenmoyer can make the grade”. The article was about his academic struggles and immaturity blahblahblah. And there is Katzenmoyer, posed, of course, with a big ol’ grin on his face. I just found it so funny. Who poses for a cover article debating his own dumbassery? Well, Andy Katzenmoyer did. Ha! Just got my snow cover in before the wire!! No need for Joe to apologise for the Jim Thome cover. The picture is Rockwellian in its composition and content; its illustration of competitive skill among orderliness and prosperity just screams America. It is a masterpiece. Many years ago I edited a basketball book. As I was going through the photos I asked the photographer if he had any where the crowd were even the slightest bit animated; in every shot, no matter how terrific the close-up leaping and catching action, the crowd in the background looked like they were listening to a sermon. You can see this in the Moncrief cover. Red-shirt-behind-striped-shirt is ahead of the play, the guy in the brown shirt is hoping, another red shirt is happy . . . and most of the rest are just staring. Worst of all are Moncrief’s teammates – all “so what”. Finally, Joe’s right – the Secretariat cover is a disgrace. The thoroughbred racehorse is the most beautiful animal on the planet, a thing of such form and power to be truly magnificent; the partnership with the jockey the finest example of teamwork in all of sport. Yet they cut out half the horse and put in the owner . . . what were they thinking? Mateo Rodriguez, that was one of the best comments ever on this blog, and I think I’ve read ’em all. Well played, sir! Just love the Jim Thome cover. Also, for all of the many Twins fans who hang out here – check out this Twins Anthem sung by Craig Finn of The Hold Steady. I like the GB Leighton song but this is much, much better. Okay, this is going to be snarky as all get-out…I miss Fire Joe Morgan. The choice by Jon Heyman as his favorite may tell us all we need to know about him. He has now gone ahead of Joe Morgan as the most-deserves-to-be-fire sports guy. I got my first SI sub at about the same time (mid-70’s) as Joe (I’m a couple years older). The reason I could afford it? I found an old issue from the 60’s (the Packers were winning something on the cover) at my grandparent’s house, and I used the subscription card from that issue to sign up. The advertised cost was something like 9 cents/issue and thankfully, SI honored it. I graduated HS in ’87, and we had a smoking area. It was just a glass-enclosed vestibule in a rather remote corner of the school. When walking by it, you could see vague silhouettes of people in there surrounded by a cloud of cigarette smoke. The scene in “Independence Day”, when they are at Area 51 looking through the window into that lab but can’t see anything because of all the smoke, reminded me of the smoking area at our high school. I think the beauty of the Thome Cover lies on the way Thome wears his trousers. There is a 50’s feeling to it, while the rest of the picture is pure XXI century. The cover is about the staying presence and power of baseball through history. #20 of Yaz looks like it was shot in Cleveland at old Municipal Stadium. I don’t think any list of great SI covers is complete without the Bernie Kosar “Last of the great quarterbacks” cover. What a great list – easily my favorite of the “32s” series. The ability to capture a moment on the field/court/ice while framing the shot with the crowd. I love looking at the various reactions of people in the crowd – those early adapters who know the crucial 3 is going in, the sheer joy as a goal is scored, the 50s gentlemen in their jackets and hats. To me, nothing captures a moment in time better than seeing how the crowd reacted to it. As a Cowboys fan, I wish it would have said “Could have been” and shown the ball going through Clark’s hands. I never saw this cover, because I broke my mom’s nice lamp when I threw my arms out and knocked it over after seeing this play…I didn’t see the next 12 covers. I spent alot of time punished after that play. But that was OK. I needed the time away from the world. Thanks for bringing that bad memory back, Joe. p.s. “The SUPER catch” works better because it sent them to the Super Bowl. Calling it “The Catch” would not have been as clever. Just my humble opinion. Never got SI as a kid, but did get The Sporting News as my annual birthday present from my parents. This was back in the late 60s when it was 90% baseball and they carried EVERY box score from EVERY game, along with amazingly (for the time) detailed stas you never saw in the newspaper, minor league reports… it was heaven. It came on Saturday. The mail usually came around 10 am, plus or minus. We lived in the country and the mailbox was by the roadside about 50 yards down a hill from the house. About 9:30 I’d start going down to check, repeating every 15 minutes or so, hoping to pull open the box to see that brown wrapper that meant I’d have something to pore over for the next week. The weeks where it didn’t come until Monday were horrible. You reminded me of days gone by where I would pour through the stats in the newspaper and read, then reread every article in my sports magazine. Thanks for this. For me, any SI cover that featured a picture of a Canadian or a team from Canada fascinated me. I always assumed that we were little more than an afterthought and not worthy of inclusion. My favourite covers are probably the Gretzky one back around 82/83 and the Dave Stieb/ Andre Dawson one a couple of years later. Stieb was my hero (and a contributing reason to my having a dead arm by age 15 from throwing sliders). I had never seen that post-9/11 cover and I have to say, I really dislike it. There was a period where I felt that SI indulged in a lot of cheap sentimentality, with Rick Reilly personifying that trend, and this staged cover is part of that era. Thankfully SI seems to be climbing out of that ditch, thanks in no small part to Joe. I realize that SI is by definition narrow in its focus but the headline “The Week That Sports Stood Still” is so trite and trivial given the events of that week. The whole thing is so lazy and phoned-in. It doesn’t belong on this otherwise fantastic list. Hate to criticize your splendid work, Joe, but how could you not include the photographers’ names? I know that you always say that these lists are ripe for criticism, and that’s why I’ve never really complained about them before. Sure, I’ve disargreed, but never been that upset about them until now. And here’s why: Michael Jordan. And it’s not that you didn’t include an MJ cover on your list of covers (even though, and correct me if I’m wrong, but he’s graced more SI covers than anyone else), but it’s the fact that you say that there’s not really an MJ cover that stands out. REALLY!?!? Maybe it’s because of the age difference, and you were raised on the great SI covers of the 70’s and early 80’s, and I of 90’s, but I think there’s a NUMBER of great and memorable MJ covers. In fact, when I think of MJ, mostly what I picture were scenes of MJ captured by SI and placed on the cover!! That’s 15 covers I didn’t even have to search the SI Vault for. Again, I know it’s your list and all, but I can’t believe that 1.) no SI writer picked any of those covers as their favorite, and 2.) none of them were memorable enough to make your list. 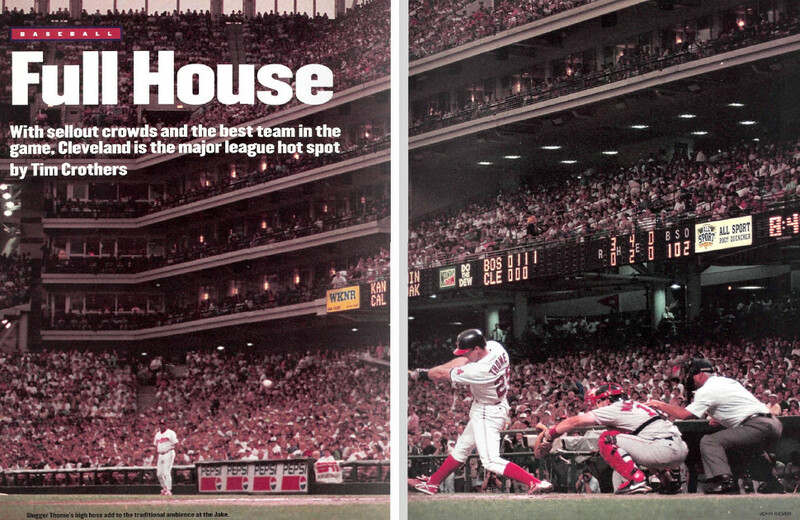 What I love about that Thome cover is that it not only invokes that original SI Eddie Mathews cover, but it also reminds me of the shot of Thome from SI’s 1995 “midseason report” issue — a photo that, for some reason, has always stuck with me from my teen years. The Thome/Target photo is great photography, but it is not a great magazine cover, as I understand the purpose of magazine covers. It doesn’t provide enough visual clues to tell me what the story is about or make me want to read it or buy the magazine. I just love how Joe (the new guy) decided one day to write this story commemorating the magazine he both works for and loves. Then asks anyone and everyone around him (fans, writers, editors, Al friggen Michaels!) to provide their opinion on the matter, and everyone didn’t just oblige they loved it! Why? because it’s a brilliant celebration, a brilliant idea, and a brilliant essay (what do you call 7000 words of enjoyment?) from a brilliant writer. This is a wonderful stepping through a period of time where every Tuesday I’d wait for the mailman to show up with a fresh new copy of SI. A lot of those covers I know I still have back home too. This was a great post, and a wonderful step into a glimpse of a time that I know will never come back. Joe, please tell us you’re going to have something to say about Bud Selig’s recent idiotic comments that he’s interested in expanding the number of teams making the playoffs. Barry Bonds with the title, “I’m Barry Bonds and You’re Not” was the best cover. @anonymous #20 of Yaz was at Cleveland Municpal. I was curious what team the Sox were playing, looked up the HoF uniform database. Only AL team with red sleeves were the Indians. Another Cleveland centric cover, eh Joe? ?